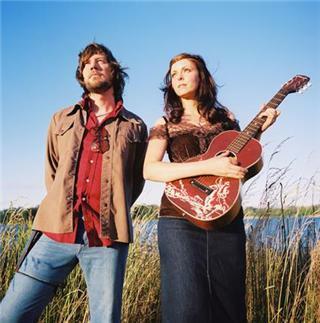 There are a handful of things about Viva Voce that lend themselves to a just-the-facts presentation: This songwriting team Kevin and Anita Robinson met and married in rural Alabama over a decade ago and made their first four-track demo as Viva Voce in 1998. Since then, they have relocated to Portland, OR, released a number of critically acclaimed recordings and toured extensively including stints with the Shins and Jimmy Eat World. As for describing the music the Robinsons makewell, that's a difficult proposition. Indie rock? Too polite. Psychedelia? Too old-school. Black-light soul with a heavy-metal heart? Um, is that even a thing? Says Anita, "Basically, with each record we're just trying to find a way to create the music that's been living in our heads since the last one." The Robinsons' mental storage space was filled to capacity while creating The Future Will Destroy You, Viva Voce's fifth full-length and the band's debut for Vanguard Records. The 10-track set comes only two years after 2009's acclaimed Rose City, about which Spin gushed, "It's the songwriting, hooks and escalating thrum of a capable rock band that pull listeners from each twinkling vista to the next." 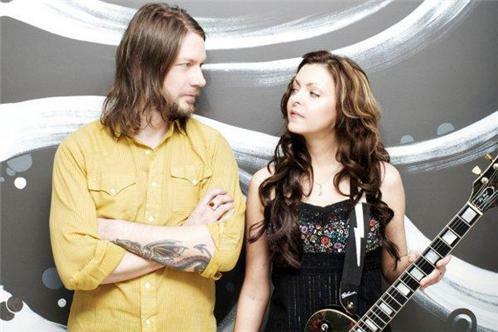 Yet during that period Kevin and Anita kept remarkably busy, recording and touring behind the first album by their country-tinged side project, Blue Giant (which occasionally features members of the Decemberists and the Corin Tucker Band). The result is the most expansive, vibrant collection of rock songs we've yet heard from Viva Voce. Written, performed, produced and mixed entirely by the duo at their Portland home studio, The Future Will Destroy You unquestionably serves as a showcase for Anita's post-psychedelic guitar heroicscheck out "Analog Woodland Song" and "The Wondering Soul" for some of the finest quiet-loud eruptions since the Pixies' heyday. But the disc also emphasizes the Robinsons' sense of songcraft like never before: You might not hear a ballad this year lovelier (or spookier) than "No Ship Coming In," in which Anita's vocals glide over a pool of shimmering space-roots atmospherics. And the apocalyptic title track? Let's just say nobody's ever made the end of civilization sound like such an appealing prospect. Those are only a few of her star turns, too: Throughout Future Anita's singing plays a more prominent role than on previous Viva Voce records, where both members split vocal duties fairly equally. 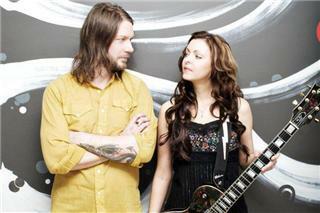 "We both still sing, but I think I've really come into the lead-singer role on this record," Anita explains. "And I love that it happened in this natural, organic way." As regards the other instruments, the Robinson-family division of labor typically saddles Anita with guitar and Kevin with drums. "Everything else," says Anita, "we arm-wrestle over." You can hear that intimate interaction deep inside this music, which both members say reflects their joy in returning to a close two-person relationship following the experience with Blue Giant and with the four-piece band that toured behind Rose City. "This is Viva Voce getting back to what it is," Anita says, adding that the lack of outsiders made it possible for her and Kevin (the self-described "knob-twiddler in the family") to work quickly and with purpose; indeed, the entire process took place over a mere four weeks this past winter. "Although we treated the songs with love and care, we wanted the record to have a feeling of immediacy. That forced us to get into high gear and stay there. You have to make decisions and commit to them, and scrap something if it's not cutting it." "The creative wheels were really greased," Kevin offers. "The way we write and record just totally clicked on this record. I feel like it realizes the potential all of our previous albums hinted at." Kevin calls Future a series of "miniature explosions," which feels right. "It was definitely a labor of love."